It began quietly and unnoticed, and will sweep over us in what feels like a weekend. We have moved from a mechanical to an electric form of communicating, traveling, building and transacting. It has changed the way we think, the way we form culture, how we arrange our societies and create our ideas of what is possible. Even the concept of what is a community is has changed. Our feelings of time and space. Our ability to influence or be influenced. Complex systems don’t grow one step upon another. They go viral. Like a meme on the internet. Like a crash in the financial market. There are two kinds of memory. As Francis Yates says in The Art of Memory, the first is a natural memory created from a personal experience that involves our conscious thought. The second is a trained memory from repeated association between a place and a thing or idea. Imagine being part of a plan to train the memory of a group in order to manage the coming “change”. The sweeping new world began with the discovery of electricity. Suddenly, a light bulb could extend the idea of day and night. And the ingrained idea that understanding came from following a line of text from left to right, building concept upon concept to reach a conclusion, was overturned with a flood of illumination all at once. A field of information came to us instantly. Our thoughts, communication and finally cars moved along a highway from here to there, like so many phonetic letters sounded out from left to right. But that would change. Where we’re headed there will be no need for roads. And so with all communication moving from mechanical devices to electrical. From radio, to television, the internet, electronic music sales, electronic book sales, Netflix electronic movie and TV show sales, to Amazon product sales. And now comes the change to the communication that is the backbone of the central bank world system we live in: money. Digital money is coming to a fiat currency system run on debt instead of surplus goods. A system of debt where we’ve run out of people to lend money to. 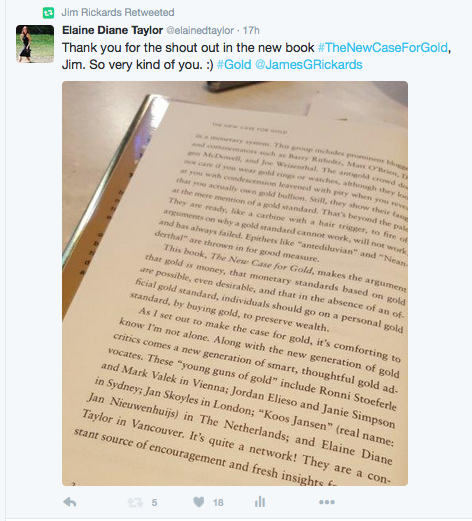 Jim Rickards said in his book The New Case for Gold, that we are now in a world without an anchor. The mechanical money system used to be based on physical gold and sometimes silver. That anchor was broken repeatedly by rulers over the mechanical age, as they sold and lent their gold, and gave favours, like the printing of a nation’s currency for a fee, as they borrowed from the bankers and other elites in exchange for funding wars. The last time the golden anchor was sold was in 1971, when President Nixon stopped the assured exchange of currency for physical gold. Too many wanted the gold. And that would break the central bank system. We’re in a world without an anchor, where the mechanical money system is ruled by an elite few, and where we’re all in ships bobbing up and down, subject to an approaching pole shift, and drowning in debt in turn. Everything is turning from the mechanical to the electric. All while new energy forms are developed quietly. Fusion, torsion, electromagnetic, sound. The mechanical moves in a series of events, a flow from one event to another in a series, while the electric world is a field. All there all at once. Off and on. Off and on. For the central bank financial world to continue as it has it will have to switch from the current debt model and try to control everything all at once. To keep us in debt forever. In order to do this it will have to have our permission. No one gives up power willingly, and so in order to win this switch they will have to either trick us, use coercion, or physically force us. There are a few elites managing the many with a carrot and a stick – with debt and no way out. The central bank is desperate to not lose power. But their debt system is failing. Very few are gaining and very many are losing their ability to sustain their families. In the opening remarks by Mr Haruhiko Kuroda, Governor of the Bank of Japan, at the G20 Finance and Central Bank Deputies Meeting, Tokyo, 17 January 2019, he said that one of the G20’s aims is for the dividends of growth to be distributed equally across the whole globe. A nation cannot put its interests first, while they address the increasing income inequality in advanced economies. The citizens are noticing. The rulers are personally looting before the ship sinks. The treasure chests are missing. The U.S. is missing $21 trillion according to Catherine Austin Fitts and Dr. Mark Skidmore, and the government just passed legislation that allows them to lie on financial statements without stating the figures are made up. The nations are bobbing up and down in a world without an anchor. They must keep us distracted while they set up a digital money system that keeps us all at the oars of the ships forever. They must convince us we are choosing to bail out the breaches and bail in our own personal hells in order to keep their ships afloat. They must befuddle us with an enemy. Any enemy that keeps the eyes and energy from the real problem. We are fed with cake and follies. The stories we hear and see every day in the media must create a group memory that directs anger towards whatever works to keep us manipulated to behave in a seemly manner, continue to pay our admission to the show and clean up after ourselves. It isn’t just an admission we’re paying to view our neighbours and ourselves. We are the product for sale. We are moved and manipulated through the currency itself, the debt instruments, as the word “current” is moved through the wire to produce a shock. And there is a shock planned to settle us back down in our seats. But at the same time the peasants have a rising rage, and are creating a tempest of their own. There’s a time now where the large group can influence the outcome. The yellow vest movement in France is holding protests for the 13th week now. Other nations have begun holding their own. The mainstream media hardly mentions it. The new technology gives the opportunity for a new system, as the old anchorless one reaches out as far across the sea as it can, and now is coming to an end. What will a new system look like? Who will keep or win power in the change? The debt model, the world without an anchor, has a chance to come to an end. Some will wash up on the beach and some will wear a life vest. Some will lie in state beyond the reach. Some elite have taken care of themselves in any and all turns. Who will wear a yellow vest? And who will wash up on the beach? My wish is for a new world and a landing that is solid. A new global monetary system that takes the new digital world and grounds it in an fashion that cannot be rocked, frightened, pushed or cheated of its own written theatre. A monetary system backed in part by physical gold. In times such as these capital moves towards something personally safer. It shifts to save instead of risk for reward. In these times it has been wise in the past to own a little gold. “The illusion of freedom will continue as long as it’s profitable to continue the illusion. At the point where the illusion becomes too expensive to maintain, they will just take down the scenery. They will pull back the curtains. They will move the tables and chairs out of the way, and you will see the brick wall at the back of the theatre”. Gold is at $1,314 U.S. per ounce. From Kitco News.